The same demand for faster access to data, which resulted in a like demand for flash storage and all flash arrays, is changing the way organizations need to approach data protection. Today, the requirements that lend themselves to the performance and efficiency of flash also make legacy data protection techniques unacceptably slow. 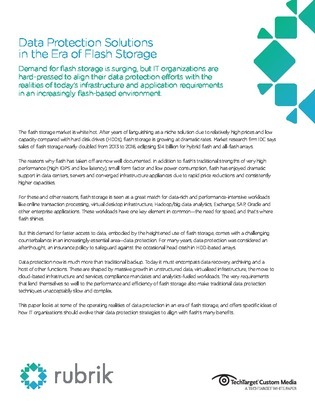 This white paper looks at some of the operating realities of data protection in an era of flash storage. Read on to uncover helpful advice on how IT organizations can evolve their data protection strategies for flash, and to fulfill a list of top 7 flash-era data protection requirements.